I made the mistake of spending too much time reading reviews on Amazon recently, and while The Respect Dare has around 212 reviews, and a 4.5 out of 5 star rating, of course I focused on the handful of 1’s, 2’s, and 3’s. And at the end of that super stupid use of my time, I felt discouraged, of course. So much so that it took me a while to remember that it always goes this way. So somewhat deflated, I returned to our work with Dare 9. And I confess, it’s the wrong time of the month for this, and the tears welled and the questions started. I do know that Dare 9 is a simple story about a step-mom who chooses to take baby steps in a relationship with her teenage step-son. And no, it’s really not about marriage, as one reviewer so vehemently pointed out. Oh. Yes, I had forgotten that. And yes, the step-mom in the chapter example did overlook an insult. She did choose to extend grace in that moment… but if she’s anything like me, there’s probably a ton of other times she didn’t. She wasn’t a doormat, rather she is a strong woman. 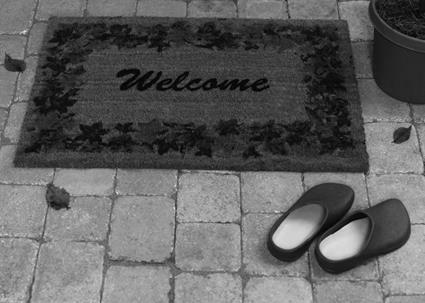 I wonder if our own fear of “not measuring up” and “needing to be perfect” makes some judge the step-mom example as the perfect example of a doormat? Dare #9’s example of the step-mom didn’t explore the many times when she DID level reality discipline on the kid for breaking the rules, and he couldn’t use his car for a few days? But the story wasn’t about those things, rather it illuminated a small moment, emptying a dishwasher, where she could be like Jesus. And if that makes her a doormat, and the book damaging to women, well, fine. And even though I’m discouraged, I still really believe that most people (myself included) are just too selfish. I still really believe that we (myself included) spend way too much time on the throne reserved for God. And I need to remember that there will always be those who believe that the only way to get your point across is by stomping all over someone else in the process. No, I KNOW there’s a better way. So did Dale Carnegie, a Christian man whose book, “How to Win Friends and Influence People” brought the gospel message to people in droves such that it outsold every book in the world, save the Bible, for decades. The Respect Dare is a sliver of a marriage relationship. It’s not about setting up an environment for abuse – it’s about applied respect in our homes. No, there aren’t 40 stories about how to manipulate others, or even, how to speak the truth in love, although that’s in there – I just don’t shout about it, because it’s my goal to be a woman of strength and dignity. Women who need to shout to be heard are disrespectful toward themselves and others. Check this guest post I did for Peaceful Wife where that little aspect, present in many of the dares, is just simply overlooked. Why do we miss it when it’s done well? Thankful to be on the journey with you today, regardless of where you are in the book, or whether you believe respectful women are doormats or not. I am interested in your thoughts, however. And if you are parenting tweens, teens, or twenty-somethings, you should totally follow Debbie. Like us on Facebook or follow on Twitter as @NinaRoesner. Come join the discussions! Read the fictional book about 6 wives who are DEFINITELY NOT doormats! Dare to Respect is changing hearts one marriage at a time. Want to get respect right with parenting? Read Debbie’s book, With All Due Respect. Hi Nina…you did a great job here of answering the accusations made. Just remember 1 Corinthians 1:18 NKJV warns us about this when it says: ” For the message of the cross is foolishness to those who are perishing, but to us who are being saved it is the power of God.” I have and my marriage have been blessed tremendously by the principles you teach married women and until I found you there was no one us explaining these things to me after 30 plus years of marriage. You are doing a great work for the Kingdom of God. Keep going! Thanks for you words today. Was a balm to my feelings of feeling misunderstood and not heard. Keep on for Jesus, you are an inspiration to many. You are an incredible blessing Nina. Don’t let the world get you down! With love. Thank you for all that you do. You are a dear sister and encouragement to so many! I second the “never read things like that during that time of month” and remind you we work for an audience of One. All that really matters is what He says about you and that’s all through the Word. 🙂 When the world attacks, it hurts, yet we are told to rejoice when we are spoken evil of for His sake and the sake of truth. (I speak this as one growing in it, and one who sadly and too often shouts her opinion to the disgrace of herself and others, can I just say even this blog entry fits Romans 8:28, through it I am yet again challenged and exhorted to keep on going!) Love you beautiful lady! I’m thankful the LORD brought me to your blog. Look forward to when I can give you a hug in person, whether it be here on this earth or someday in heaven. Dear Sweet Lady–do not read reviews during your cycle!! (((hug))) I must admit as a postmenopausal woman i am JOYFUL to NOT have that emotional trauma each month! (But i cry at every Hallmark commercial no matter when they play!!) Your message is what GOD says. And God’s message is not the one the world wants to hear or is willing to take. My pastor is currently going through Eph 5… you know…. THOSE verses. He is doing a great job matching what God said with truth tempered with the reality of the world we live in. Don’t give in to the negative. You have done woman a service giving us tools with which to live GODLY lives with our husbands.